There must be a Federal election coming. The Greens have declared their support for funding and building a full fast rail network on the east coast of Australia, serving Brisbane, Gold Coast, Sydney, Canberra and Melbourne (as per the official study from a couple of years ago). Yesterday Labor made a pledge to get started on buying the corridor for the same network. And today the Coalition has pledged $2 billion for fast rail between Melbourne and Geelong – upgrades and additional tracks so that trains run at an average 160 km/h (rather than this being the top speed, as now). The investment would also include business cases for other projects. The study is well worth a read if you’ve never had a look. It would run between Brisbane, Sydney and Melbourne. Gold Coast and Canberra would both be served by spur lines. This means compromising on timetable frequency and operations. The study says this design reduces the required station footprints, and speeds up the journey for through trains. Let’s assume this plan is the most feasible. Fast rail has shown proven benefits in many countries. If all this investment occurred in Australia, it could cut air travel and spark development along the route – at least in the areas served by a station. But there’s a catch. There are doubts about HSR’s viability for interstate travel in Australia. Our geography – the distances involved – makes it really difficult. Unlike in Europe or Asia, the planned line between Melbourne, Sydney and Brisbane is, I suspect, with current technology, a bit too long to be really competitive against air travel, with too few large intermediate destinations. It probably makes sense to reserve the corridors, but I’m less sure about trying to build the whole east coast network right now – especially with such a backlog of public transport projects in major cities and along regional corridors. What’s most viable right now? Rather than try and take on building a full HSR system which might cost tens of billions of dollars with sub-optimal travel time outcomes, what if the most obvious portion, Sydney to Canberra, was the focus for now? That’s the sector that’s relatively straightforward. 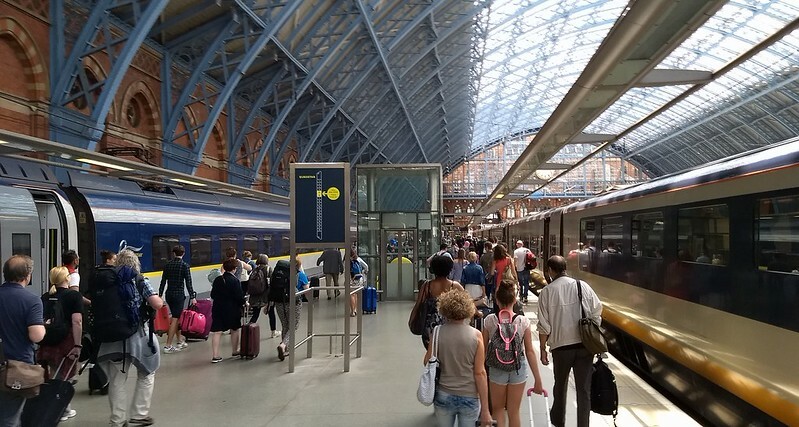 At an expected 64 minutes by train, it is a short enough distance to be competitive with air (55 minutes plus transit time, which could easily be another 30-60 minutes), and long enough to be competitive with road (about 180 minutes). There are also fast-paced improving local connections at each end. It would be a good first project, and if done well, gain good political support for further extensions or lines elsewhere, thanks to serving Canberra’s politicians. To be fair, the study actually said this should be the first section. I’m just not sure the politicians are paying attention. While we wait for east coast high speed rail, there’s a compelling argument for upgrades to the existing regional lines for intra-state travel (such as Melbourne’s commuter lines to Geelong, Ballarat, Bendigo, Seymour/Shepparton, Gippsland) to get ensure the existing fleet can attain and stick to their maximum speeds for more of their trip: full duplication, for a start, and provision and separation of metro services, especially to Melton and Wyndham Vale. In this respect, the Federal Coalition’s pledge today makes some sense. It seems like quite a lot of money for only a moderate time saving – if the train fleet needs to be replaced, should they be aiming for higher speed than average 160/top speed 200? Of course, assuming it includes track amplification, there would also be capacity benefits for Melbourne’s west. With any of these plans, high speed rail needs to be accompanied by boosts to local public transport connections around the regional stations. If a major rail line is reliant on park and ride, that will severely limit patronage. A full interstate HSR network along the east coast has a lot of potential… eventually. But I suspect shorter distance projects are probably more viable right now. I see Albo recently claimed that Sydney to Newcastle by train is slower now than 50 years ago. I’d be interested if anybody has fact-checked this claim. Every such claim made in Victoria is invariably wrong. There is no current express service between Sydney and Newcastle. 60 years ago, there was an express service, one peak hour service in each direction, and it was faster than the services which operate now, which mostly stop at nearly every stop between Gosford and Hornsby. The express service could do the run non-stop or one-stop. Everything else got out of the way. I don’t think it is likely that the express service will return. There are actually rather few point to point customers from Sydney Central to Newcastle. The Newcastle services are mostly extra-suburban commuter services for the Central Coast commuters and there are very few actual commuters actually coming from Newcastle. So, technically, Albo is correct. I mean to say, the current Newcastle line services stop at every stop between Gosford and Newcastle. Not between Gosford and Hornsby, that’s wrong. Isn’t this pretty much what the Liberals were promising at the state election? I’m pretty sceptical that you’ll get the trip to Geelong cut to 30 minutes. Assuming you can separate the metropolitan part out with quadruplication (either via Wyndham Vale or back via Werribee), you still need to vastly speed up getting through the metropolitan area (currently 12 minutes to Sunshine) and getting from Lara to Geelong (currently around 15 minutes). And you’ve probably got to have a Geelong metro as well serving Waurn Ponds (and maybe Torquay in the future) to Lara (and maybe through to Wyndham Vale/Werribee given links between the outer west and Geelong, which I doubt fast rail would be servicing). So you basically split the existing Geelong service in half, primarily serving it’s local, and a fast train basically going direct from Geelong to Southern Cross (maybe could start at Waurn Ponds, stop Geelong, Lara, maybe Wyndham Vale/Werribee, and run direct to Southern Cross). How many of those trains would really need to run – just in the peaks? I really can’t see the business case stacking up. I think the main benefit of HSR/VFT is the regional areas of huge growth between the capital cities and the debate about competing on flight times between a major city issue is a distraction of seeking perfection over possiblity, and not where the majority of daily passenger numbers are going to come from. If we look at the large population growth along the Illawarra and South coast, and the growth around Maitland, these areas would be commuter friendly into the the greater Sydney area. So yes build the network in phases but it needs alignment and signalling that supports > 200 km/hr, it needs to be separated from the urban network through the major cities, and most importantly the land for a network needs to be reserved now not later. For a country like Australia that’s massive by land, hasn’t got a massive population and major cities are quite distant from each other I don’t think an east coast HSR would be that successful at this point of time. I think the priority for HSR at this time should be regional towns to major city connections eg Geelong-Melbourne, Newcastle-Sydney-Illawarra/Canberra. First it would be a higher return on the investment since the competition with air travel would be lower as regional flights are really expensive compared to any train fare the HSR would have. It would also encourage city workers to live in regional cities helping them grow while also allowing them to keep their jobs in the major cities. It would also be a huge boost for employment in regional towns and there would also be a boost for consumer spending in the regional towns as the new residents would shop in their local shops. It would also attract investment in regional areas too. Why focus on interstate when our country rail systems are crumbling. The cost would be high, probably more than any daily commuters would be willing and able to pay. a far better idea would be to create more employment at Maitland or Geelong, or other initiaitves to making them more attractive places to live, like better schools or universities or hospitals, for example. Fares for a lot of these long commuter journeys are way too low. Compare the cost of a 100 km trip vs a 10 km trip into London or New York or Chicago or European cities. Or even Chinese cities. Then compare the cost of 10 km vs 100 km trips in Sydney or Melbourne. And then compare the service standards. Commuters from Woy Woy to Sydney and Rouse Hill to Sydney will both haven brand new trains soon. Commuters from Woy Woy will enjoy seats for everybody, wifi, power outlets, tray tables and only 2 intermediate stops at major interchanges. Commuters from Rouse Hill will enjoy standing in cattlecars for a whole hour, no views, and tedious all stops services. Then go and look at the price per kilometre for the fares. I’ve done the math, so you don’t have to. Woy Woy 72km 6.9 cents./km for commuters on the new $50 weekly capped fare. Rouse Hill 47 km 10.6 c/km on the Opal $50 cap, for commuters. 17.45 c/km for the casual user buying an $8.20 Opal single trip ticket. 14.38 cents for a casual user who has an Opal card. Its quite annoying to try and find english train fares. One example: Milton Keynes, which is comparable size and distance to Geelong. Normal fare seems to be A$42 a ticket , one way, on weekdays. Yearly ticket, 9.910 $A. That’s only $19 if you travel 10 times a week for 50 weeks of the year. To Geelong, $13.40 single peak trip. $5.26 per trip on a myki annual pass. allegedly. Actually that last figure assumes you travel every day ( including weekends ) on your myki 365 day pass. $7.68 seems to be an estimate of the actual price each way for a 50-week, 5-day Geelong commuter. That is about 1/3 the english fare. A good balanced piece on the feasibility of HSR on the east coast. I suspect that most Melburnians on packed trains will not want public funds spent on Sydney-Canberra. People in Geelong, Ballarat, etc would rather the funds spent improving their commute. Canberra seems too small to justify a HSR connection. They’re not big enough for a (real) international airport. Is there any technology yet, at a commercial level of production cost and reliability, that will enable an electric-powered plane to approach the speed of a jet? I doubt it, but I’d like to learn if I’m wrong. I ask this because people out there, who claim to be innovation experts, like to talk occasionally of post-fossil-fuel planes that run on electricity. Leaving aside the present weight and capacity issues with batteries, speed will be a problem for interstate travel on planes that aren’t jet powered. Planes driven by propellers, and large enough to carry passengers, simply can’t go faster than about 350 km/h. This would suggest that high-speed rail would have an increasing role in our future because a reduction in the use of fossil fuels to power air travel will mean lower speeds and/or less travel. Could we direct the majority of international low-cost flights to Canberra instead of Sydney Kingsford-Smith? And link that up with HSR Stage 1? As for alignment, we probably should secure the corridors for HSR now, and also allow for re-aligning other intercity/interstate rail routes (whether owned by V/Line, NSW Trains, or Queensland Rail) where possible, or separating them from suburban services. 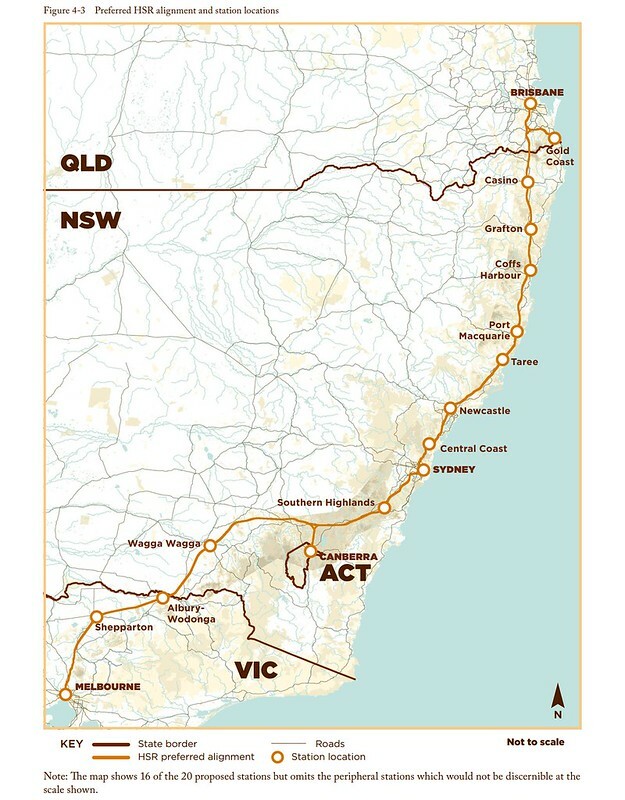 The rail lines from Sydney to Newcastle, Wollongong, and Goulburn (even Albury) could really do with some straightening (not sure about the Blue Mountains), as well as parts of the Ballarat Line (particularly the track just west of Baccus Marsh). Not building HSR has not resulted in better public transport – it just resulted in 12 diesel submarines and more road tunnels. 90% of the voters want HSR because a 350 km/h train is clearly faster than driving. Even a 200 km/h train going from Geelong to Ballarat is clearly faster than driving. But the public does not think a 60 km/h suburban train is faster than driving. Perhaps having a 200 km/h railway will increase support for 60 km/h suburban rail? If not, at least students in Newcastle will be able to get to Sydney quickly and take many cars off the road. Right now, the train journey is probably much slower than driving. That kills the arguments about rain, cold, wind. Bicycle tunnels are much cheaper than road tunnels and of course eliminate the possibility of being hit by a car. It is unfair that cars and trains get tunnels but bicycles do not. Perhaps it is worth building bicycle tunnels in Melbourne too? In Russia, Moscow to St. Petersburg has a fast train. Might be worth looking at as a comparison, as like Sydney and Melbourne there is almost nothing in between except lots of flat land. The best high speed proposal for Geelong line is in the following website. They are supported by RFI, and me They aim to start off with a 300km/h+ route between Dandenong and Geelong via Southern Cross, Werribee and Avalon Airport. Not if you have to drive to Geelong station, spend an unknown amount of time looking for a place to park, get there at least 10 minutes before the train leaves, have a plan B if you miss the train, and your destination is literally within 10 minutes walk or tram from Southern Cross. I used to live in Canberra; in the 1990s it was pretty much equal time from the centre of Canberra to the centre of Sydney to catch the Murrays coach – about 3.5hrs – as it was to travel to the airport, board, fly, disembark and get transport to the centre of Sydney. HSR with terminus in the middle of the cities should be a no-brainer. That’s not even getting into the rort that is the airfares on that leg, often more than a return flight to Bali! Hardly anyone is actually travelling CBD to CBD. The usefulness of CBD to CBD transport depends very much on the extent and quality of the public transport in the cities at both ends of the trip, and both going and coming back. Public transport in Canberra is reasonably mediocre. If I was an arbitrary Canberran who wanted to go to Sydney for the weekend, I’d drive. The only exceptions to this would be (a) not have a car or (b) going to some part of Sydney where parking is impossible. And even in the latter case, parking is probably more available at Canberra Airport than near wherever Murrays runs from these days. A person going from Sydney to Canberra would have the same issues. If you don’t have good access to speedy and reliable public transport in Sydney, then either driving to Canberra, or parking at the airport and taking the train, are going to be easier than trying to get to where the bus goes from. And, you can come back when you like. And , you don’t have to deal with Canberra’s extremely mediocre weekend public transport. At the time you’ve written this post, I was away in Japan and got the chance to ride on the Shinkansen and many of the metro rail lines criss-crossing their cities. Most of the trips I took via rail in Japan are either faster than travelling by road, or at least close to matching the time when considering the traffic jams they get in the cities. The Shinkansen is convenient and well-used in Japan and perhaps about half the price for tickets in comparison with airlines when travelling half of Japan (such as going from Hiroshima to Tokyo), and because of that, they’re nearly at capacity (even though the country itself is undergoing a declining population). As a result of that, the government has funded 3 trillion yen towards JR building a superconducting maglev Shinkansen line between Tokyo and Osaka and this has kickstarted the construction of maglev beyond their test track in 2018, with expected completion of the Tokyo to Nagoya leg in 2027, and further towards Osaka somewhere in 2040. That being said, HSR in Australia is a dream and I am not sure if I will ever see it built in my lifetime and I say that as someone in my 30s. But if we ever do go down the path, I think we should just skip conventional railed HSR and go straight to maglev. HSR in Australia will unlikely see upgrading of existing rails and would result in standard gauge rail with less curves to cater for very high speeds. Maglev HSR would easily support speeds of 400 – 500 km/h in comparison to 200 – 350 km/h in standard gauge HSR. This would be highly competitive to airlines (900 – 1000 km/h), with energy consumed per passenger over distance being significantly less that than flying. Most of the arguments against maglev seems to be around being unable to upgrade existing rail where HSR is already in place.